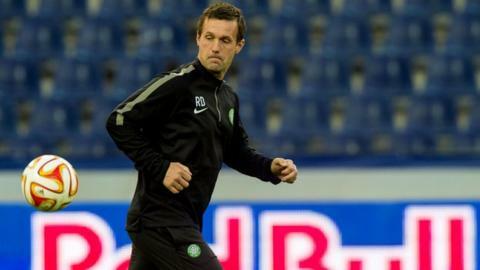 Celtic manager Ronny Deila trains his side in Austria ahead of their Europa League tie with FC Salzburg. Celtic manager Ronny Deila has backed up defender Jason Denayer's claim they can go all the way and win the Europa League this season. The campaign begins this evening in Austria against Salzburg, with the Scottish champions eyeing up a place in the Warsaw final. "If we get the right progress, and of course a bit of luck, anything is possible," said Deila. "But for now we will try and progress as a team and get through this group." Celtic entered the Europa League after defeats to Legia Warsaw, then Maribor ended their Champions League hopes. And, the Norwegian boss has warned supporters that Salzburg are every bit as good as those teams, and are a side Celtic can learn a lot from. I like the way they play and there are things they do that we want to do with Celtic. "They are different teams, they play in a totally different way and that's what's exciting about playing European football - you meet different opponents, " he said. "Legia and Maribor were counter-attacking teams, but this team is going to attack us and that is going to be another challenge. "They're a good team, they've good players, they've played in the same style for a long time. In the league - like Celtic - they have been dominant. "I like the way they play and there are things they do that we want to do with Celtic. "They were very unlucky against Malmo. In Europe there's a small difference between losing and going through." Goalkeeper Craig Gordon said the players are dreaming of a European final, but acknowledged it will be a difficult task. He said: "It's possible, of course it's possible. "We are an awful long way from that at the moment, we have to concentrate on getting out of this group first and then the teams coming down from the Champions League make it a difficult competition from there on in as well. "I think you'll have to be lucky with the draw to get to that stage, but certainly as a club and a squad we're certainly big enough to take that challenge on and try and do that. "I think for a player to actually win something and get a trophy at the end of it that would be pretty special. To win any European competition we're going to have to win some very difficult games against some great opposition. "It is a different challenge from what we face week in week out in the league but it's nice to come into Europe and have that different style of football to play."